Legislature praised as Moody's upgrades RI's financial outlook, citing stronger economy. Editorial: "A new and brighter day seems to be dawning [for RI]" due to current State Reps.
Rep. Craven applauds passage of bill to eliminate "master lever"
Rep. Craven applauds passage of bill eliminating "master lever"
Rep. Robert E. Craven (D-Dist. 32, North Kingstown) presents a legislative grant for $2,500 to North Hockey, a non-profit corporation dedicated to raising money for the North Kingstown High School hockey team. 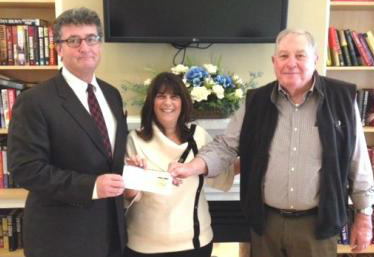 Rep. Craven thanked for legislative grant by North Kingstown seniors. RI Gov. 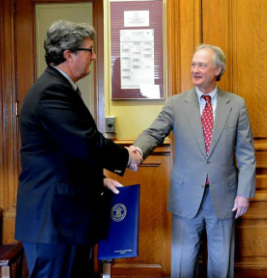 congratulates Rep. Craven for securing $6M for Quonset Development. 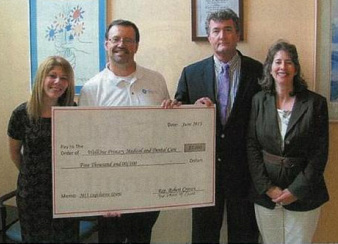 Rep. Craven presents a $5,000 legislative grant check to WellOne CEO Peter Bancroft. The grant will help purchase medical and dental equipment for the North Kingstown center (NK View, Oct. '13).